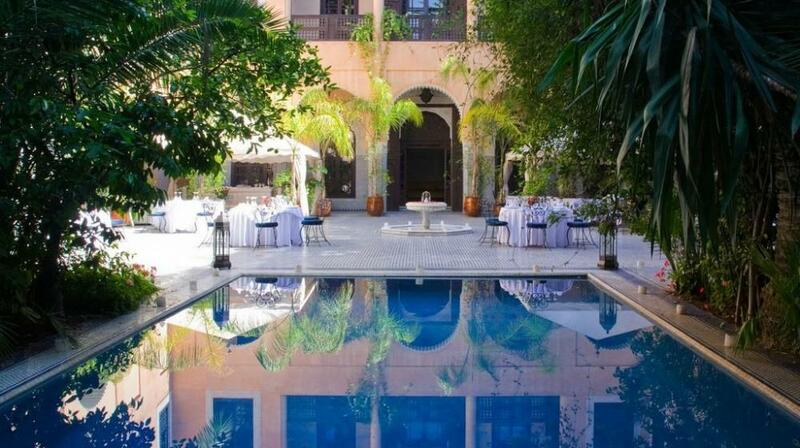 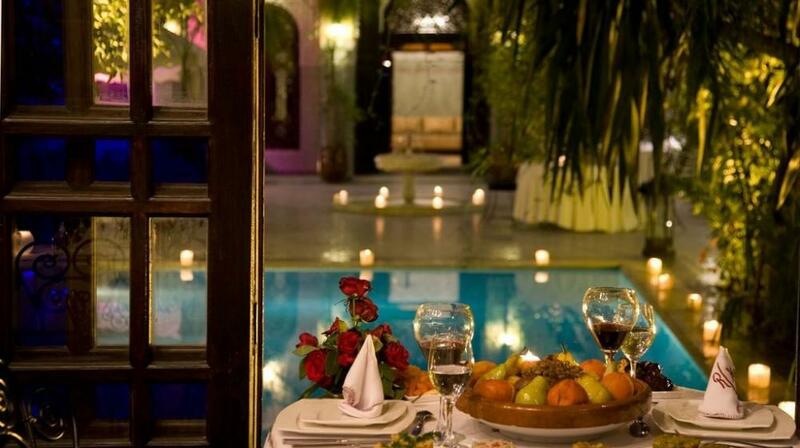 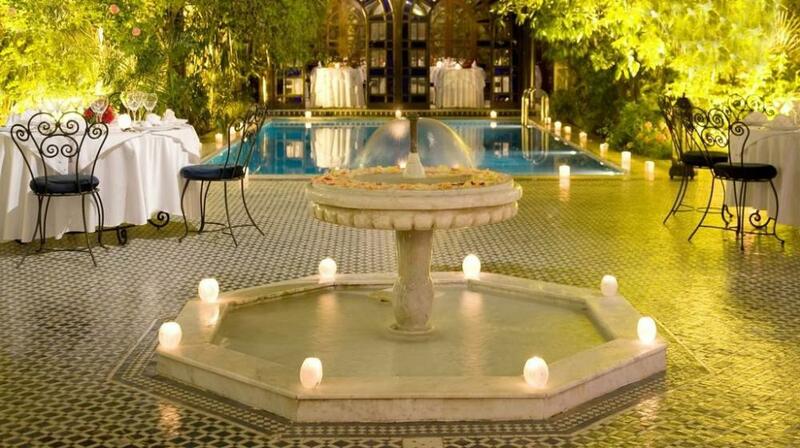 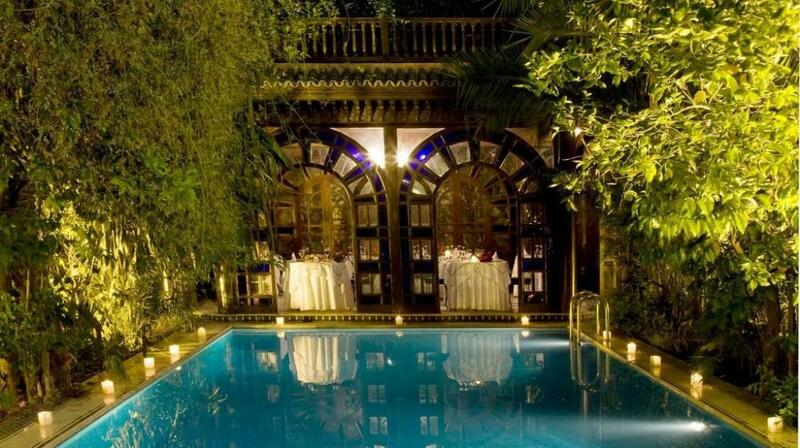 Palais Shéhérazade & Spa lies dreamily and enchantingly amidst the lively and animated medina of Fes, a short distance from Batha Square in the ancient medieval walled centre, a superb 19th century palace, restored to its natural arab-andalusian origins. At the heart of this extraordinary palace is its magnificent courtyard, with its sumptuous andalusian fountain and its unforgettable lush verdant garden emanating exotic fragrances that linger provocatively throughout this regal residence. 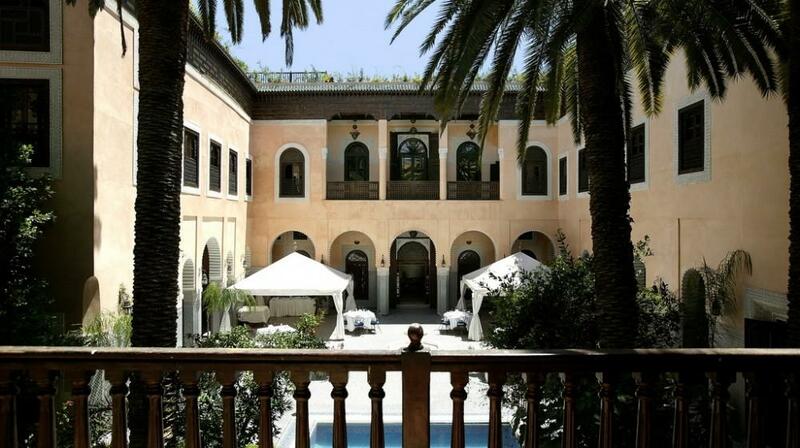 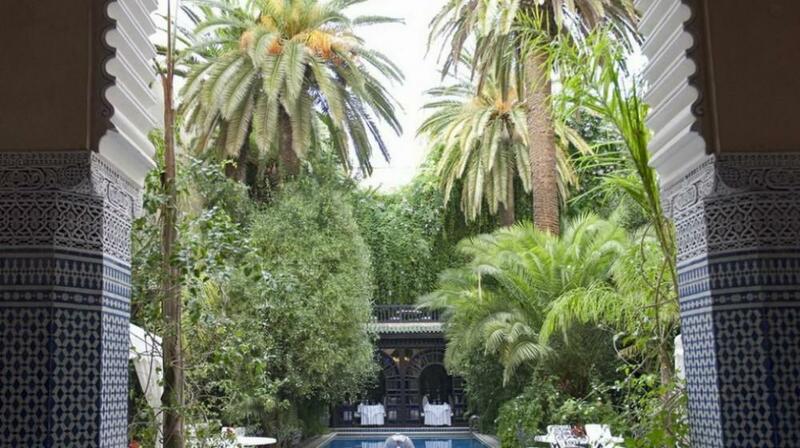 Here, between imposing centuries-old palm trees, guests find an inspired haven of comfort and serenity, breathing soft sweet scents of flora, languidly savouring native mint tea or simply soaking up the warm and mystical Moroccan sun. 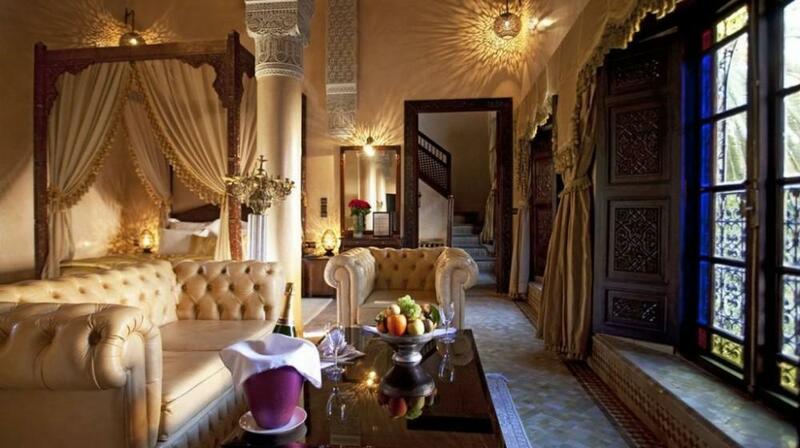 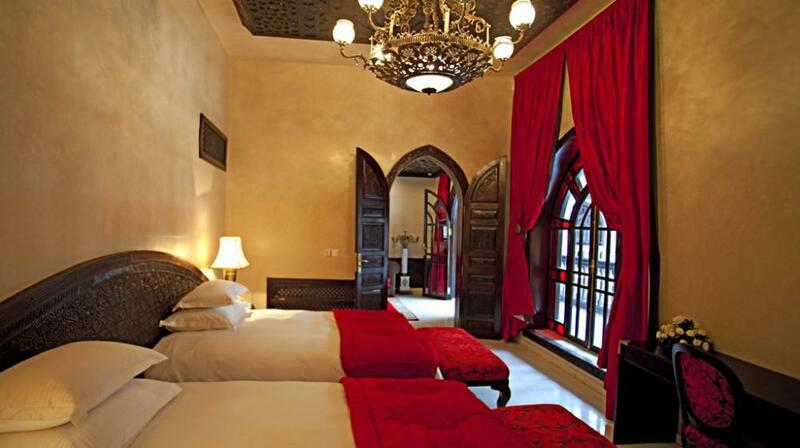 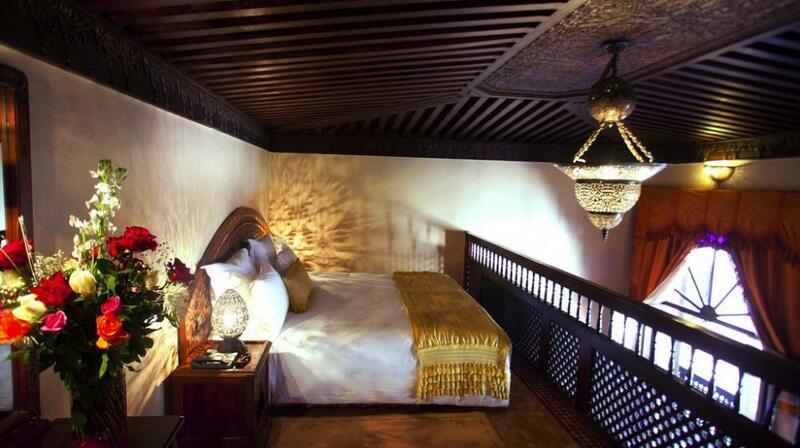 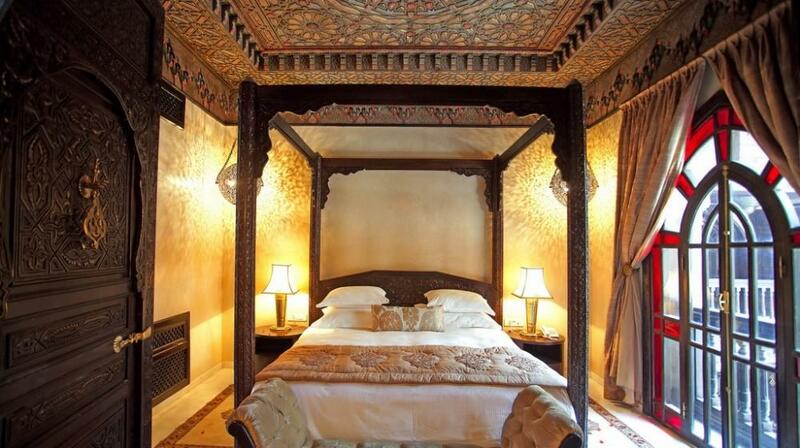 Guestrooms are likewise elegant and refined with such rich details and furnishings as doors and headboards carved in authentic cedar wood, elaborate light fixtures in pierced copper and fine fabrics in hand-embroidered shantung silk, to name but a few of the impressive architectural features of this imperial riad. 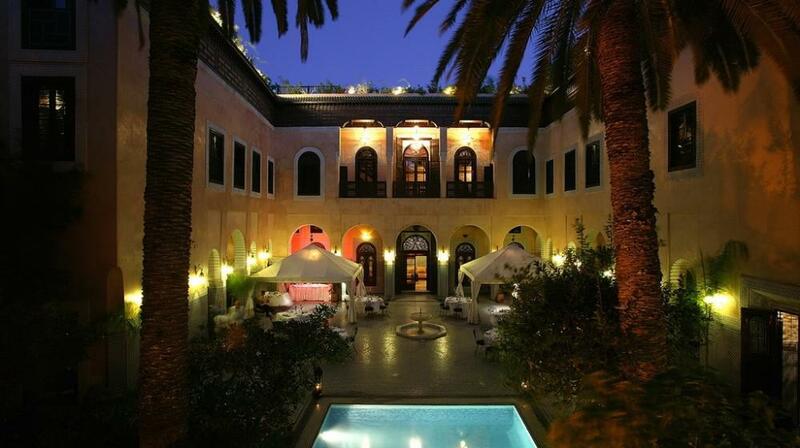 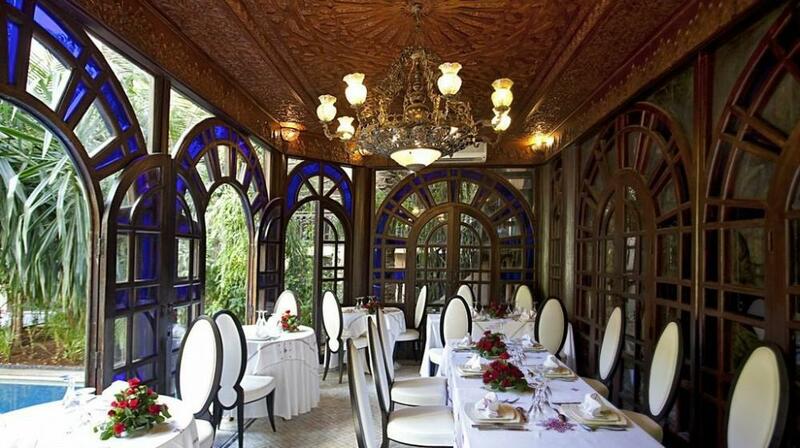 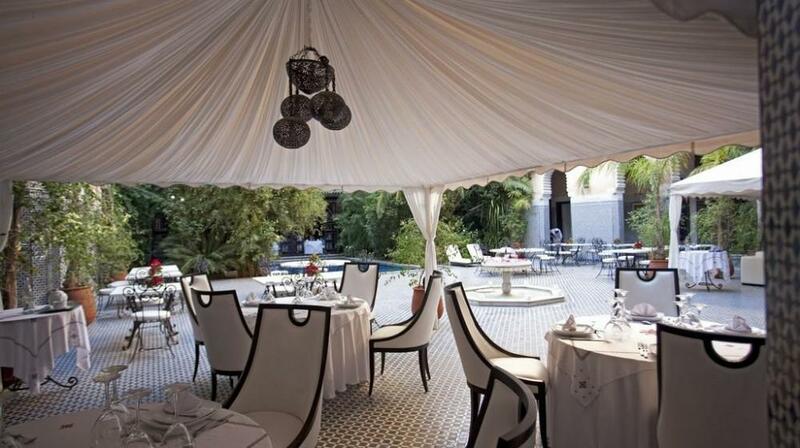 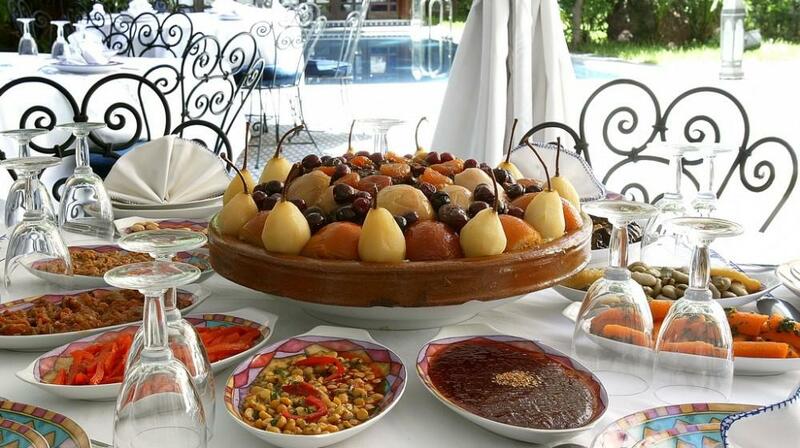 The palace also boasts one of the city’s most revered, genuine Moroccan restaurant, serving exquisite culinary delights from ancestral recipes and traditions. Everything a wandering traveller could wish and more awaits you at this prominent luxury accommodations hotel. 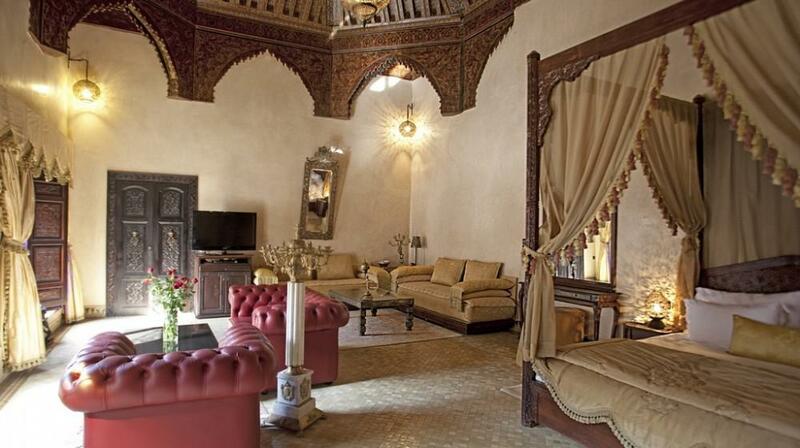 Children: Free! 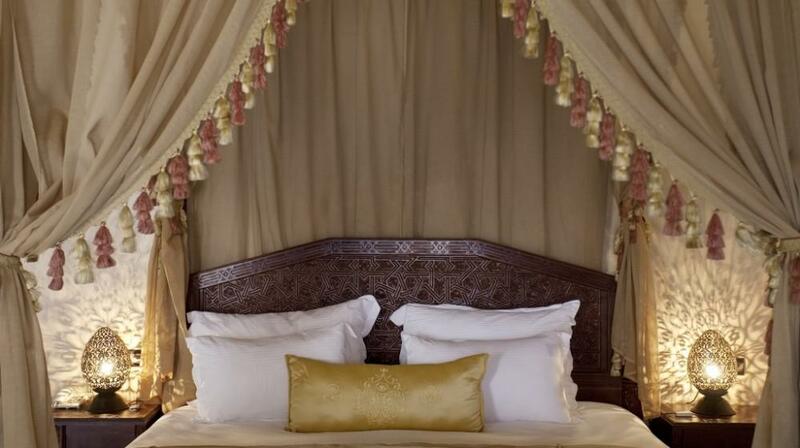 All children equal or under 3 years stay free of charge when using parents beds. 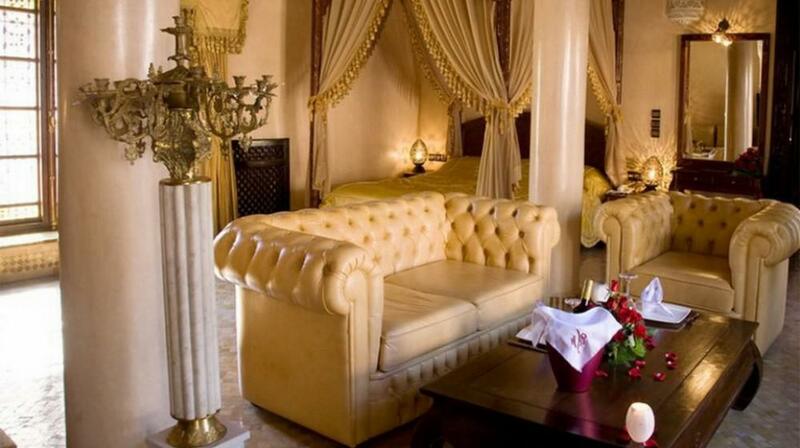 Extra beds Children: All children equal or under 12 years is charged € 35.00 per person per night when using extra beds. 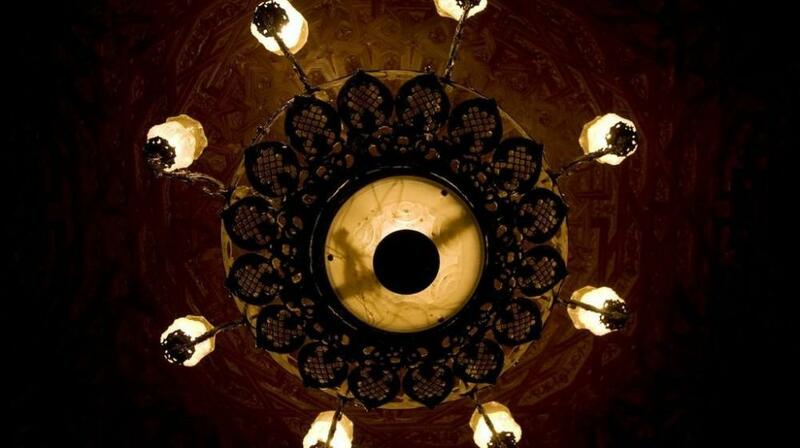 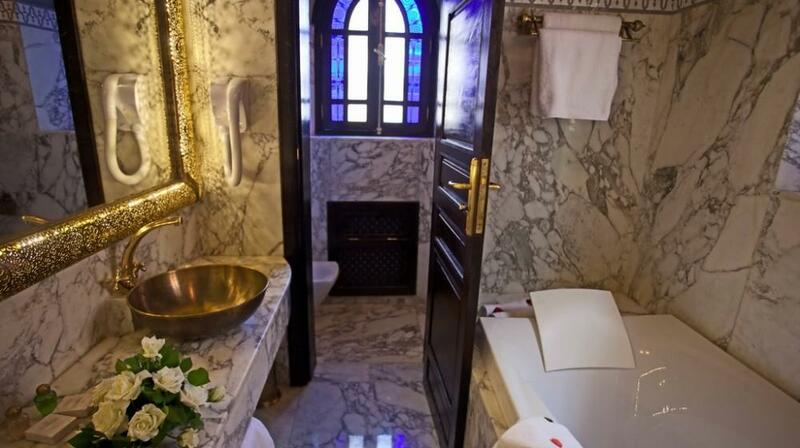 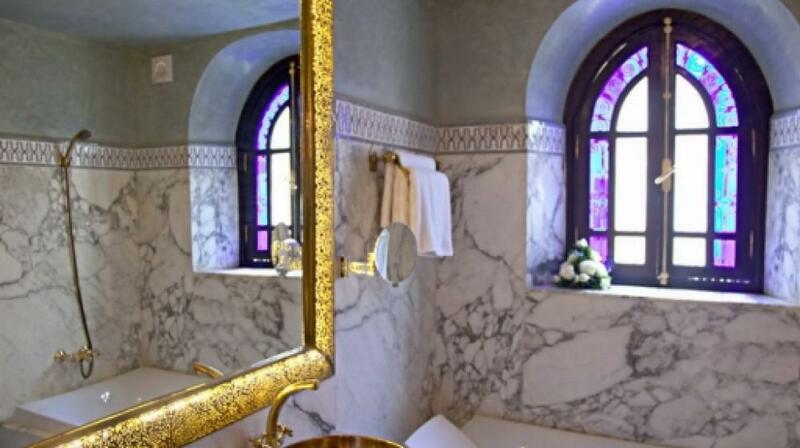 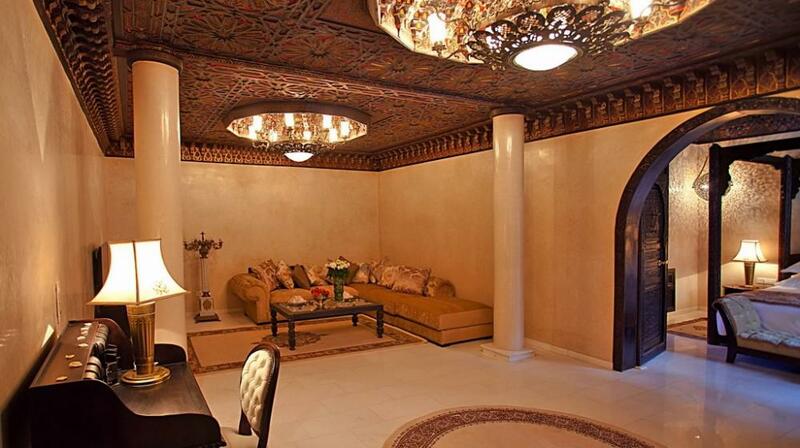 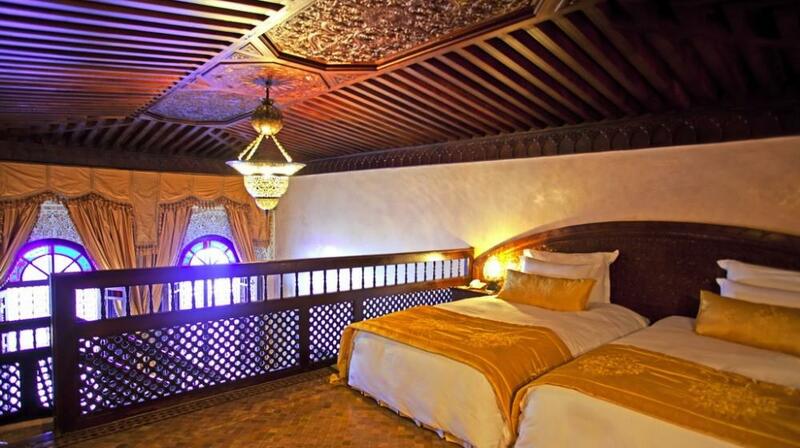 Every detail is conceived to the highest standards of arabo-andalousian architecture with the most refined materials. 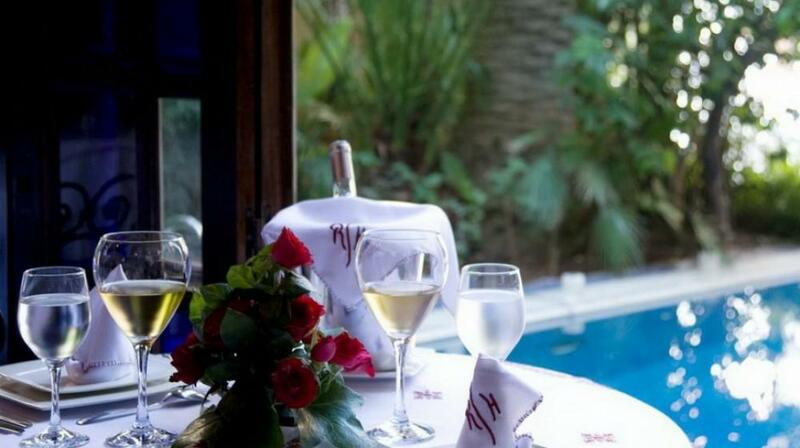 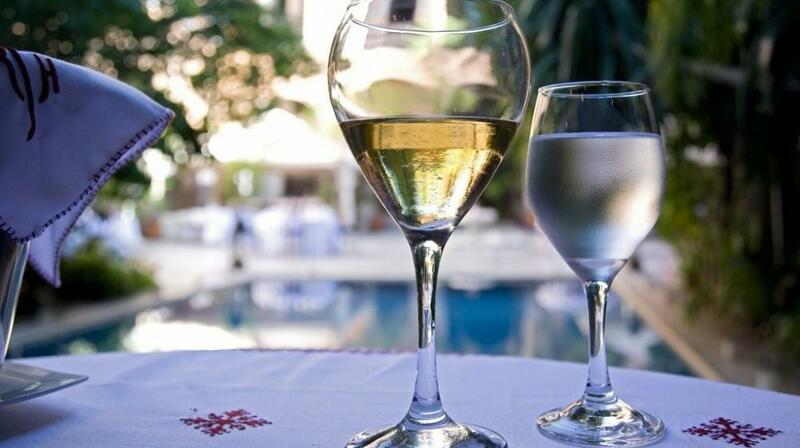 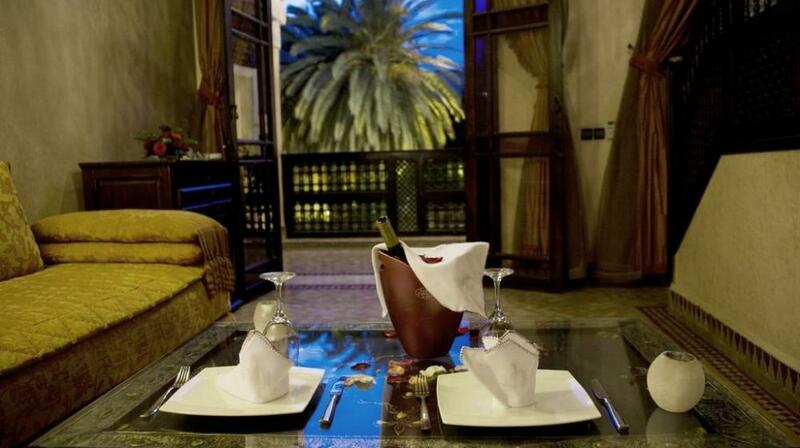 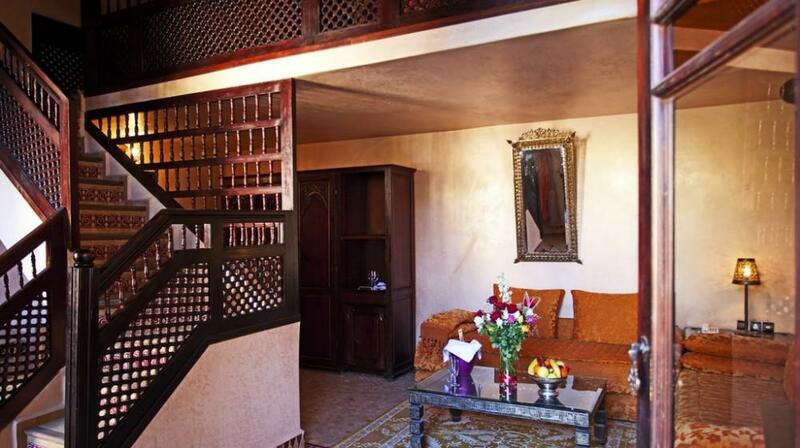 These suites offer a warm and romantic atmosphere for your holidays in couple. 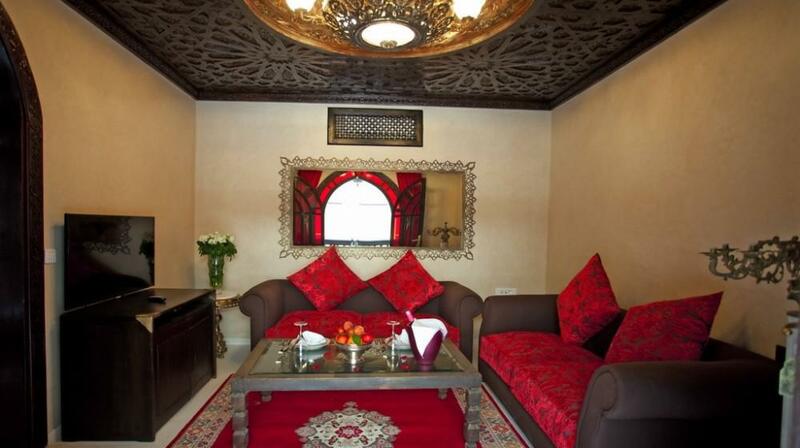 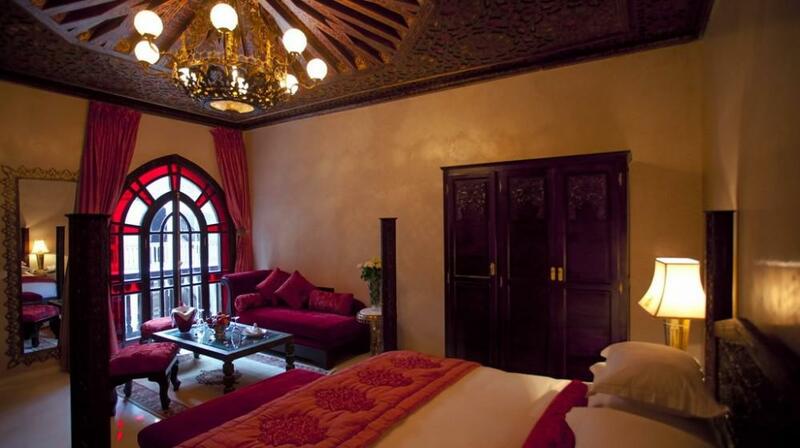 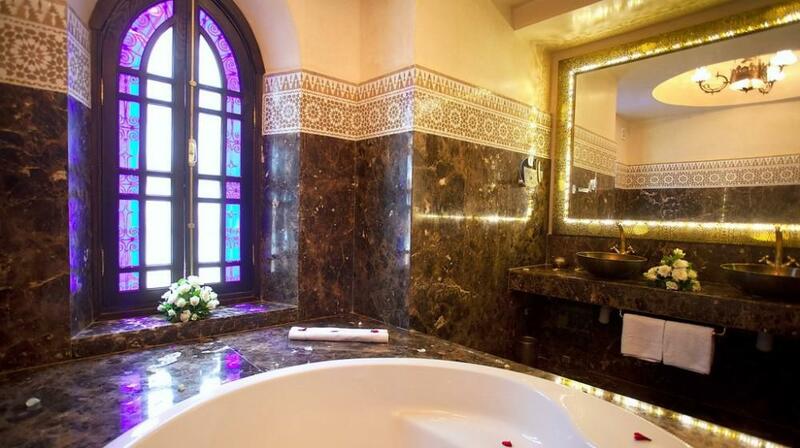 Our Junior Suites offer the authenticity of a XIXth century palace combined to modern comfort. 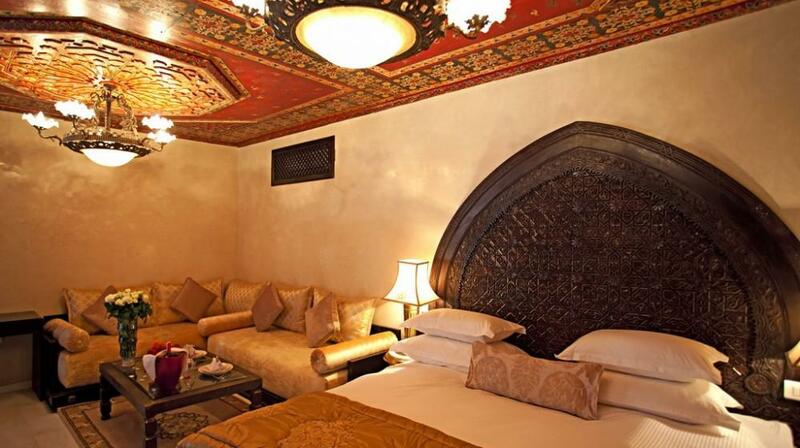 Our two-floor suites with mezzanine will transport you centuries away offering you a taste of ancestral fassi nobless art of living. 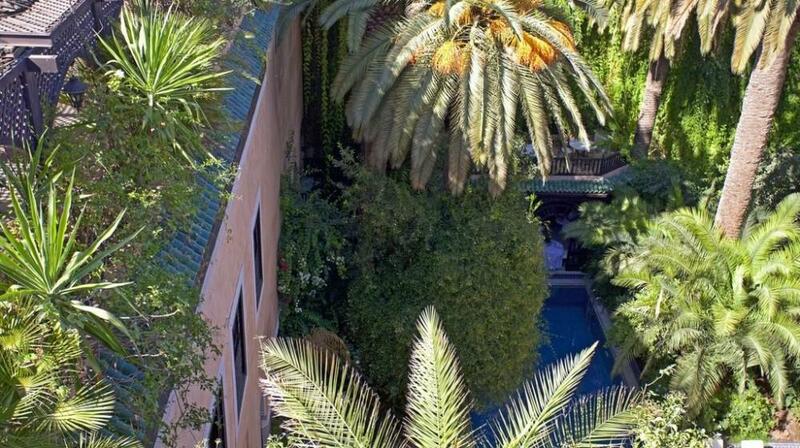 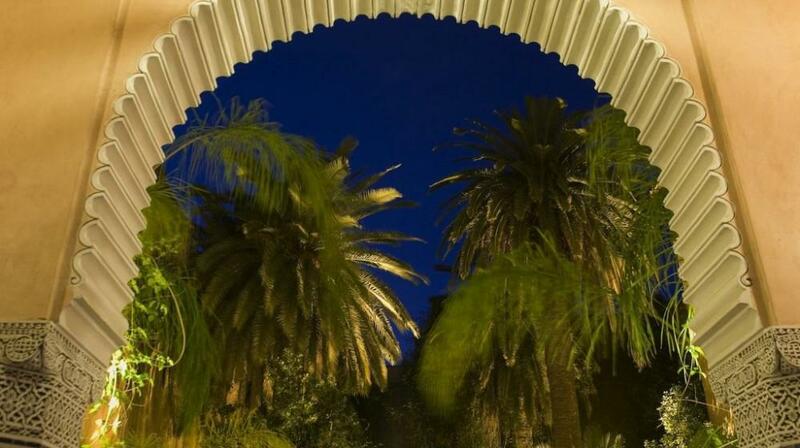 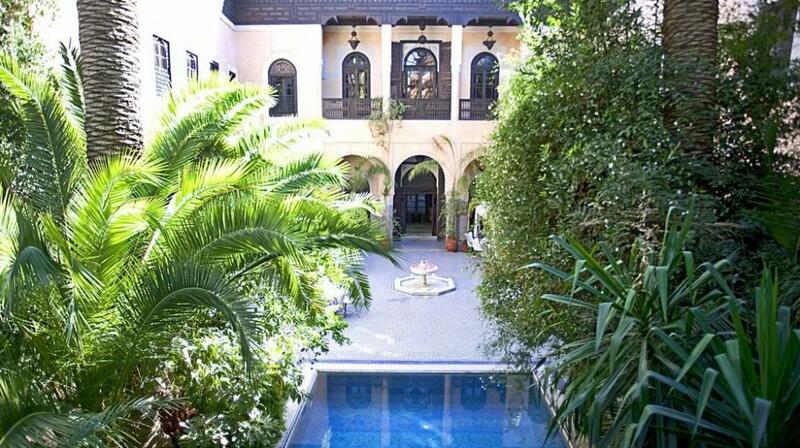 The one-floor suite offers a beautiful perspective on the andalousian garden and century old palms. 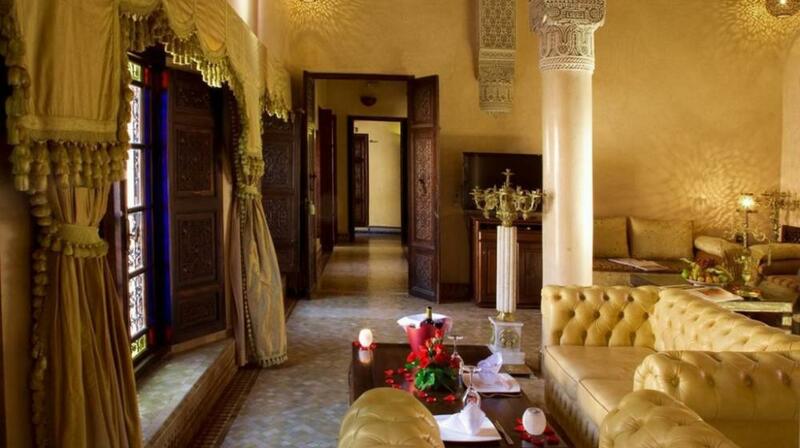 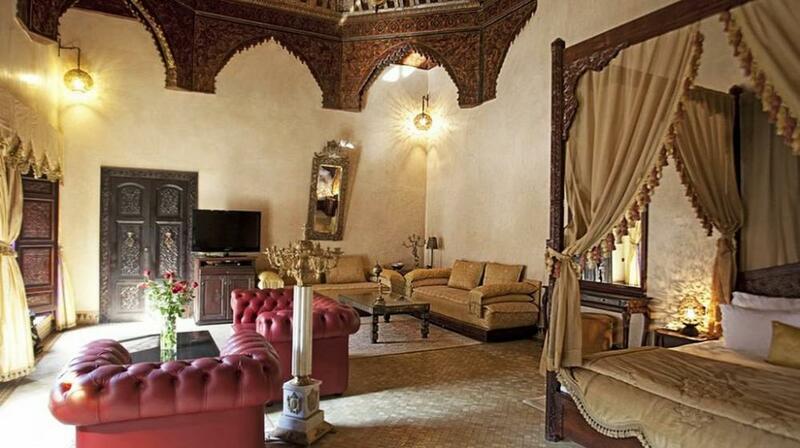 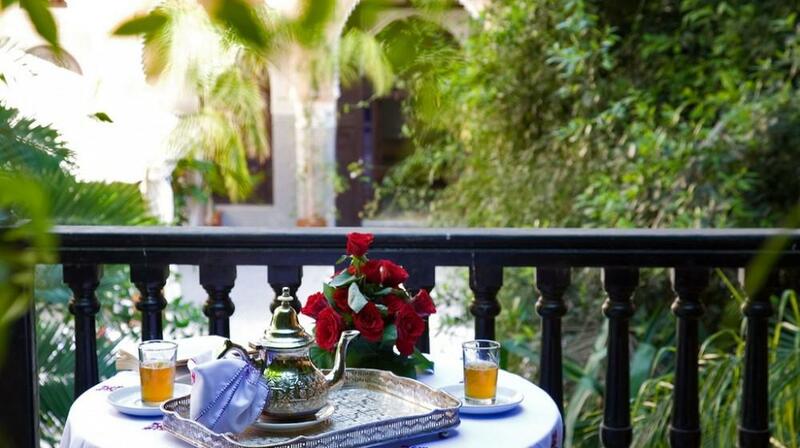 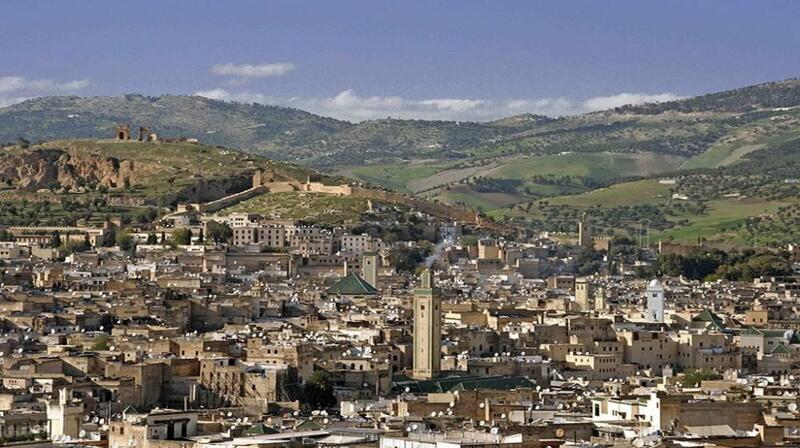 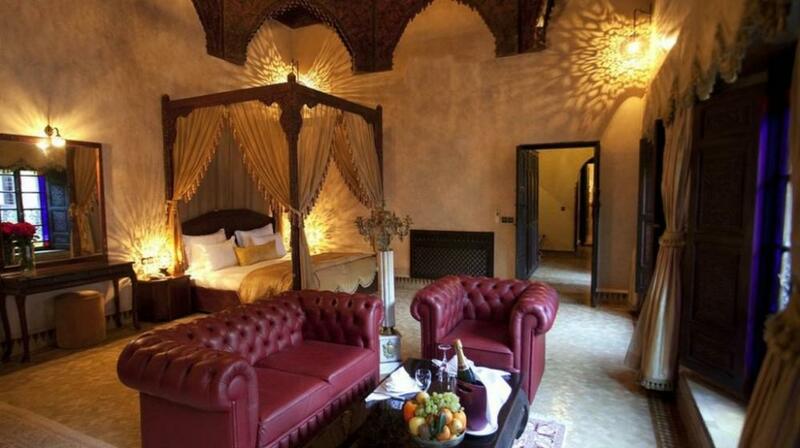 These exceptional suites, conceived to the highest standards of the traditional arabo-andalousian architecture, offer peace and relaxation in the heart of the XII century medina of Fez. 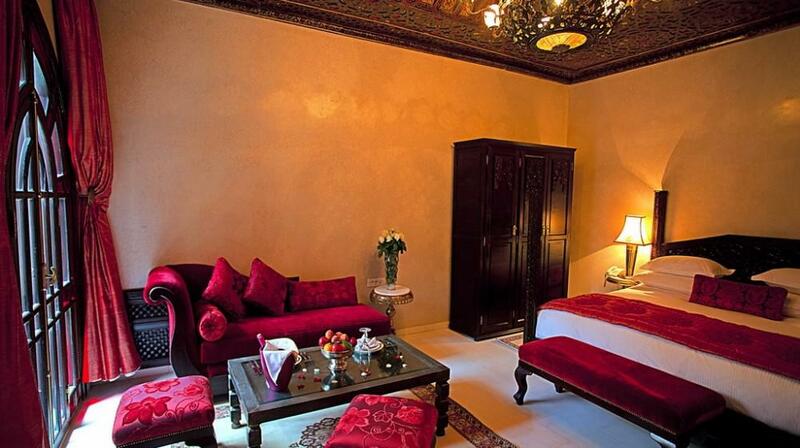 The rare antiquities, ciseled copper chandeliers, spacious bathrooms with Jaccuzzis, tailor-made handcrafted furniture form a delightful atmosphere. 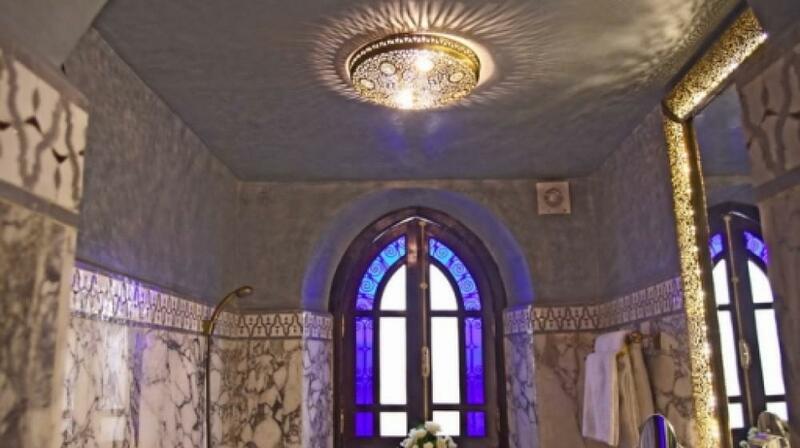 The white greek marble from Thassos in contrast with the hand-sculpted multicoloured cedar ceilings characterise the unique beauty of traditional moroccan palaces.